We’re less than three weeks away from this year’s December 4th deadline to submit your audiobook productions for the best chance of being on sale this holiday season. With that in mind, today’s lesson is about the file submission process. Being so close to the goal can lead to tunnel vision, but following the steps below, along with my other lessons, will ensure that you don’t stumble at the finish line. Export your entire audiobook to its own folder. Name each file with its section number first, then the section name. Ex: 00_Opening Credits, 01_Introduction, 02_Chapter-01, 03__Chapter-02, etc. Stick to alphanumeric characters, dashes, and underscores. File names with other characters might cause upload issues on ACX. Listen to the beginning of each file to ensure it has the correct credits and/or section header. Listen to the end of each file to ensure it includes proper spacing and contains no narration from the next section. Now that we’ve covered best practices, let’s look at some common issues that cause productions to be returned to the producer by our QA team, and how to rectify them. Part of a chapter/section is repeated in another section. For example, an audiobook production contains opening credits at the start of both the first and second file. To avoid this, make sure each audio chapter/section matches the text exactly during the Edit/QC process. I also recommend checking the head and tail of each file after editing and mastering your audiobook to make sure they don’t contain duplicated audio, and to confirm that each starts with a section header and ends with the last sentence of that section. A chapter/section is named properly, but uploaded twice to the production manager. Consider a checklist for your production that lists all of the files, and checking off each file when it’s uploaded. A chapter or section is named improperly, resulting in duplicate uploads with different file names. This third issue occurs during the exporting process, when you output each chapter or section from your DAW as an MP3. Before you export each chapter/section, double-check that you are exporting the correct one. If you’ve got multiple sections in one project file, don’t forget to isolate the correct section for export, and be sure to select the next section after exporting the previous. My favorite solution is to create a separate project/session file for each chapter/section within your DAW of choice. If you have a work folder that contains a project file for each section, your workflow will be smoother and easier when accessing/re-accessing an audiobook’s production. Having a separate project file for each section all but guarantees a section will be exported as two separate files. Listening to an audiobook in the Audible app. This is when two or more entire sections are combined into one file. ACX’s Audio Submission Requirements state: Each uploaded file must contain only one chapter or section. This requirement is in place for the sake of the listening experience. Navigation within an audiobook should be simple. If chapters one and two are combined in the same file, the listener won’t be able to skip to the latter on their device; they would be forced to navigate manually through one file in hopes of finding it. This can also be solved during the export process. As I noted previously, creating a separate project/session file for each chapter/section will ensure you’re not combining two separate pieces of audio. Once again, this is about the best navigational experience for the listener. Having a section header for each chapter/section clearly marks its position within the audiobook. ACX’s Audio Submission Requirements make it clear: Each uploaded file must contain the section header, if contained within the text (e.g., “Prologue”, “Chapter 1”, “Chapter 2”). Making sure each file contains its correct header is as easy as checking it before and after you export the audio. I would also suggest checking it again before you upload each file, just to be safe. 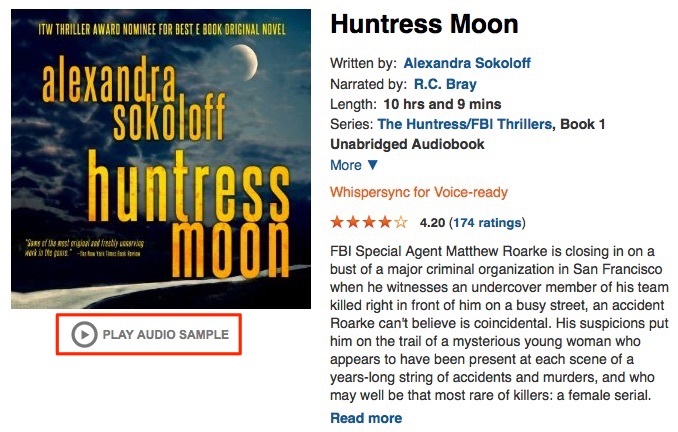 A red box highlights Huntress Moon’s retail audio sample. Additionally, I strongly advise against including opening credits and/or music in your sample. This content is secondary to your actual performance, and potential listeners may not make it through to hear your narration. Finally, make sure the sample includes no explicit language or material, as listeners of every age and sensibility can preview samples on Audible. That’s today’s lesson. Following each of the tips above should result in a seamless upload and submission process, which means fewer headaches for you, your Rights Holder, and your potential listeners. This entry was posted in Actors + Studio Pros and tagged ACX, audio scientist, audiobook, Audiobook Creation Exchange, audiobook production, file management, make audiobooks, producer. Bookmark the permalink. After reading this, I have to wonder just what exactly ACX actually DOES to the audio for 2 weeks+ before releasing it to sale. I listened to the retail copy of one of my audiobooks, and there were 4 instances (4!!) of a sentence repeated, where I had missed removing extra takes (bad me), and three of them were in the same chapter! Did they honestly not catch any of them? According to this post, they would have sent it back to me, it seems. Ok I do all these things and when you put it together you always get the chapters wrong! 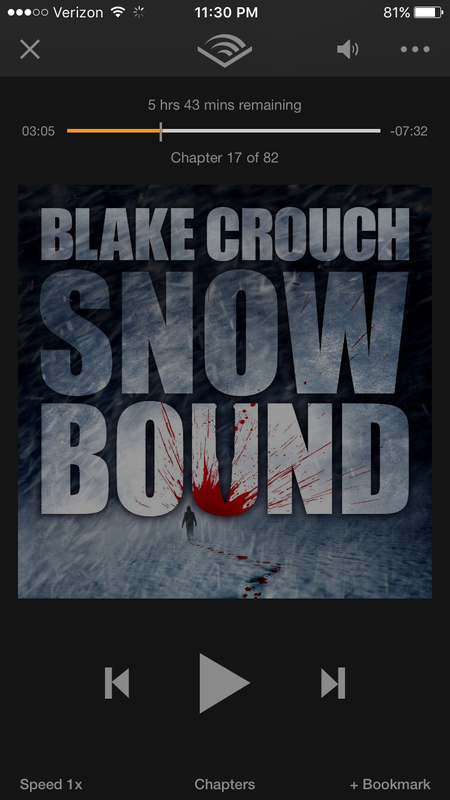 I notice it on everything I listen to on Audible. I think you need to think about your production too! The audio quality of my retail samples on Audible is significantly degraded from what I have uploaded. Does ACX or Audible do additional processing on our samples? They sound as though they have been over-compressed. Degraded sample quality certainly doesn’t help sales. Is there a way to replace the retail sample with a clean copy? What is the proper format for naming the retail sample? I looked everywhere and can’t find the answer. Thanks! I’m reading these comments, and shaking my head. As audiobook producers, we are independent contractors, and, ultimately, responsible for our own quality control. ACX QA is NOT your safety net – that’s what your proofer is for. You do use one, right? So, in the case of the repeated sentences, the problem is *clearly* operator error. What does it accomplish to drag ACX over the coals for failing to fix it for you? Nowhere in this blog entry does Alex say that ACX is looking for these errors. Nor is it reasonable to expect that they would be. YOU should be. It’s your name that’s going on the cover. Ensuring chapters are all there and in the right order is also *your* responsibility. The advice to check the beginnings of each chapter before *and after* uploading, is solid gold. Do that with your titles, and I can guarantee (at least from my own experience), that you won’t see any more problems with this aspect of production. And, yes, the retail samples are degraded. I have no idea what the actual logistics are, but try to imagine how much sever space, and bandwidth, is required to store and stream the tens of thousands of samples for every title that’s currently available on Audible.com, and you start to get an idea of why Audible might want to keep those files small, and, consequently, at a lower resolution. Audible “degraded” the retail samples of “The Martian” and “Gone Girl.” It did not, as far as I can tell, appreciably impact sales. You can still see what the files are named, so if you’re using a consistent naming system, you can tell right away whether the correct files have been uploaded in the correct order. The upload page also shows you the duration of each file, so you can check that against you original masters as well. Again, it’s basic housekeeping, and you work with whatever the interface gives you.